Katie and David Turpin love to serve guests this light and savory entree during their backyard parties in Fredericksburg, Texas. 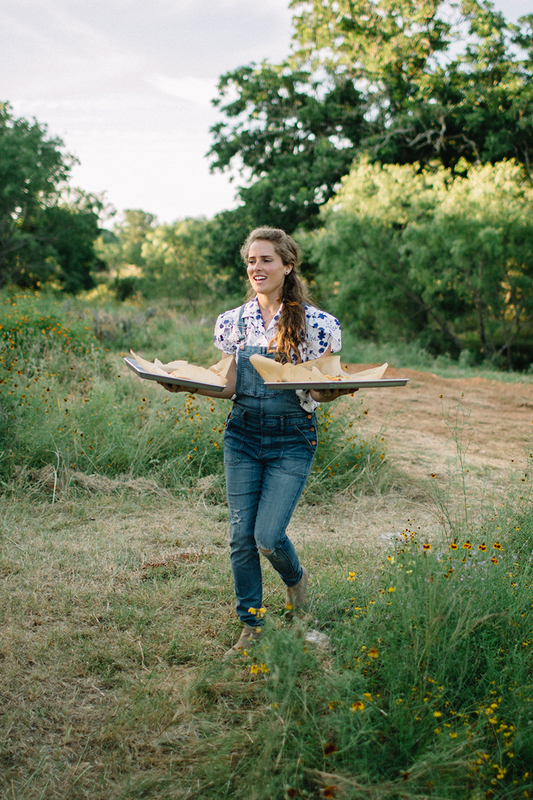 Be sure and check out the full feature on Katie and her hill country entertaining style here. Preheat the oven to 420 degrees. Use parchment paper on the pan and place the salmon on top. Warm up the coconut oil in the microwave for 30 seconds or until in liquid form and spoon all over the salmon filet. In a small bowl mix the paprika, garlic powder, and salt and sprinkle on top of the salmon (the coconut oil has probably cooled by now but that's okay). Slice the lemons and place on top along with 1/3 of the pile of chopped fresh dill. Pull apart the garlic bulbs but don't completely peel them so they can roast in their "shell" and drizzle the olive oil on top to coat the garlic. ROAST in the oven for 20 minutes, check the salmon to see if it is pulling apart and fully cooked... if not there yet give it a couple more minutes. Mix vinegar, water, sugar, salt, seeds, bay leaf, and peppercorns in small saucepan and bring to boil to dissolve the sugar. Let cool for 10 min then strain into a bowl so that just the liquid is left. Add the fennel and let "steep" for 10 min. Strain the liquid and refrigerate the fennel until ready to serve so that it is crunchy and cold.